The easy, economical and attractive way to package a wide variety of products from food to apparel, in polythene and polypropylene bags. The Heat Sealers come in Benchtop, Hand Held, Automatic, Pedestal, Magnetic Hold-Down, Heavy Duty, Wall Mounted and Special Purpose models. Even if your packaging requirements are relatively light, a carton sealer can improve your productivity over manual packaging or alternative packaging systems. For shrinking pallet bags and film, this gas gun is designed to wrap anything, any size. With an adjustable regulator, power is controllable to suit all kinds of film. Semiautomatic and fully automatic machines. Hand tools also available for small strapping applications. Secures your load. Simple to apply. Safe for storage and transport. 95% waste reduction with 3M Stretchable Tape. A fast, easy and versatile process for on-line, on-site production of protective polyurethane foam packages. 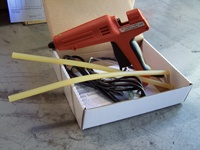 Electric, single hand operated glue guns ideal for sustained industrial use. Bond quickly and efficiently. 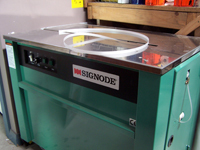 From all-in-one shrink systems to traditional L-Bar sealers with shrink tunnels. * Manual and Automatic models available in benchtop or console styles. * Large range of models available. The current Rapid range includes tools for many stapling applications. Tools of different designs for use in all sorts of materials using many different types of staples and leg lengths.